The tube is called Country girl with a piggy. Paste paper 3, apply your mask, delete, merge group. Paste frame element 26, click inside with your magic wand, expand by 5, paste, paper 14, invert, delete, select none, move this paper below the frame layer. Paste element 80 above the frame layer at the bottom, adjust once the grass is pasted. Paste element 61 below the bench, move to one side, duplicate, mirror, duplicate again and move above the bench layer, duplicate and move to the left. Resize your tube to 28%, place in front of the bench on the grass layers. 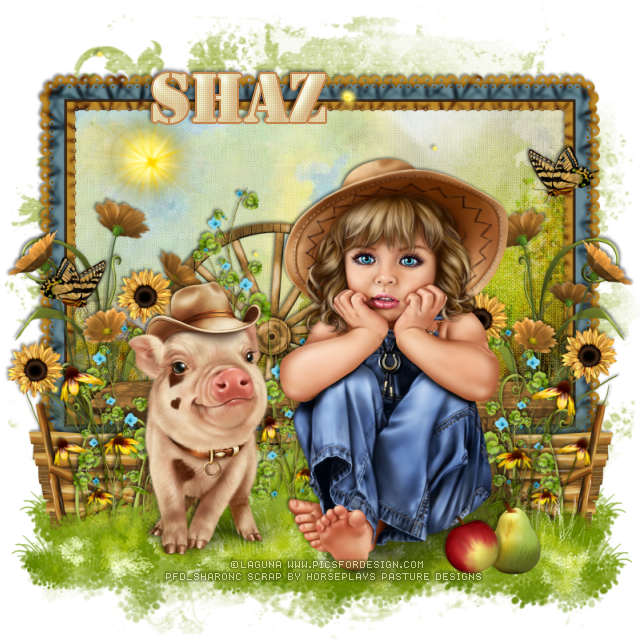 Paste element 11 on the left below the first grass layer, resize to 75%, duplicate, mirror, duplicate again, resize to 75% again, move down a little bit, duplicate, mirror, duplicate one more time and move in the middle between the pig and the little girl. Paste element 48 on the frame layer, moving to one side and down by the grass layer, duplicate, mirror, duplicate and move toward the center. Resize element 8 to 45%, place about center on the frame layer. Resize element 68 to 60%, place on the right below the bench layer, duplicate, mirror. Resize element 10 to 60%, paste on the left below the crate layer, duplicate, mirror. Resize element 14 to 60%, paste above the bench layer, duplicate a couple of times, mirror one and move where you like. Paste element 13 on the frame layer below the flowers, duplicate, mirror. Resize element 7 to 30%, place on the right by the girl. Resize element 77 to 50%, place below the other flowers, duplicate a few times and place where you like. Resize element 1 to 30%, place where you like, duplicate, mirror and place again. Resize element 15 to 25%, duplicate 3 or 4 times and place where you like. Paste element 79 on the frame layer.